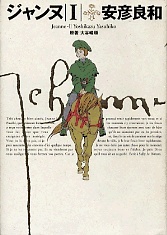 Set in Medieval France during the Hundred Years War, Joan is the story of Emil, a young woman raised as a man by Baudricourt, the same person who took Joan of Arc under his wing. Guided by visions of La Pucelle (the name given to Jeanne by followers), Emil seeks to unite France under the divine rule of the King. In her quest, Emil goes to the same places Joan had traveled through, and gains her own followers in the process. However, Emil is opposed by the Dauphin Louis, a brute enforcer who fears no divine power and wishes to make his own bid to rule the country. Jeanne was published in English by ComicsOne as Joan from October 22 to November 1, 2001. Before I read this, I breezed through the synopsis and thought that this manga was actually about Joan of Arc. However, it isn't a straight retelling of her story. The main character is Emil, a girl named Emily who was raised as a boy to hide her from her father's family, who wanted to kill her. Since she was a child, Emil has seen visions of Joan of Arc. When she is sent by her foster father to go and support the king in his battle, she becomes able to communicate with Joan's spirit. From that time, Emil's story parallels Joan's, as Emil struggles to complete Joan's work and unite France under the king. This manga has a really interesting premise, and the historical details are handled well. It's also in full color, so quite unusual, and the art is done much more closely to a "Western" style of comic book than typical manga art. The politics are discussed in detail, and military strategies are addressed. Emil is an interesting character. She was raised as a boy, and for the first part of the manga she tries to maintain a male role. Unfortunately, later in the manga, she spends a lot of time getting pushed around by the men who surround her and worrying about being raped. Although Emil does continue to fight, and fight well, I wish she hadn't fallen into so many feminine stereotypes. I liked how the supporting characters were realistically portrayed (especially considering this is a manga). They often resemble historical portraits, so there aren't any bishounen here. The historical people have clearly been well researched. Some of the situations may seem a little fanciful, but they all have historical basis. If you like history, especially its warfare and politics, you will probably enjoy this manga.